Okay, this is framing 101 for photography. By using this technique, you can figure out composition and depth-of-field. Recently, my daughter, Sabrina, had to do a personal project for school. She could have done the project on anything, such as parents careers, food, sports, etc. She chose photography and I was happy as I was able to show and teach her a lot about that subject. 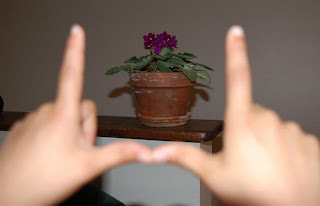 So, one of the first things I did was show her how to frame objects or subjects and to see how they would look. I also taught her about lighting, composition, focus, etc. She grasped the concepts quickly and did very well with her project. Off course she did good, she's my daughter.